I wish I’d kept a list of all the things campers have said to me and in letters home over the years when they feel homesick, in an attempt to be picked up from camp. Mostly these are desperate efforts to make sure their adults understand how uncomfortable they feel and how they want that feeling to stop, right away. Actually walking home verses FEELING as if you could get up and try to walk home are two entirely different things. Homesick is a feeling at camp as predictable as mosquitos at night, and spaghetti for dinner the first night at camp. Having an understanding of Herzl’s philosophy about how we handle homesickness as well as concrete things parents can do before packing are useful tools in minimizing how much power the homesick feelings have on your camper. 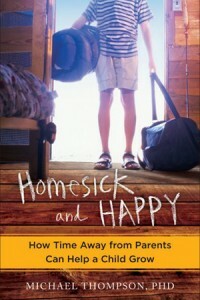 First, homesick is a feeling, not an illness, though confusing because of its name. Campers will say it makes them feel sick, some even develop symptoms to match; stomachaches, headaches, dizzy, increased heart palpitations, even throwing up, without any disease present. There is much research and understanding available about how interconnected our minds and bodies are. Homesickness is a state of disequilibrium. When we are off balance in one area, the other areas are off balance as well. Along with understanding homesick is a feeling, it is also a NORMAL feeling. It means you have a home you love; with people in it you miss. That is the normal thing we humans do when we are away from things we love…miss it. Parents often ask if they should bring this up even if their camper has not said anything. They worry that they will plant a seed that isn’t there. BRING IT UP. If your camper hasn’t thought of it yet, they will eventually. They just have not had practice going away, missing you, or anticipating what this will all be like. It is better to practice and plan at home with you, then have it hit them the first night or even the night before they leave. Having them be empowered to make a plan with you, rather than you making the plan and telling it to them is a significant shift, nodding in the direction of the autonomy and confidence that summer camp so beautifully supports.Whatever feeling they bring up, accept it as their feeling, rather than try to convince or soothe it away. It is normal as a loving and caring parent to want to help them become comfortable again. Unfortunately this does not yield successful results nor offer the tools to help themselves soothe when you are not with them. It quietly under minds the notion that what they are feeling is not right. For example, if they ask, what if the kids in my cabin don’t like me or are mean to me? Rather than covering, “No, you’re such a nice kid, you have lots of friends at school, just be yourself…” ask a more open question that validates their feeling and allows for more curiosity and understanding, such as, “You’re worried the kids won’t like you, what part of you are you thinking they won’t really like” or “How will you know if they don’t like you?” This information can lead to either healthy brainstorming or helpful concrete information they can use. Our philosophy at Herzl is to not convince the camper not to be homesick, but instead to not let the homesick feeling be so bossy that is ruins all the great stuff about this camp adventure. We discuss making time (10-15 minutes) a day to be homesick, write letters, cry, talk it out with a staff member, share about home, and then tie that up and make yourself get back to camp mode. We often talk about this transition as “fake it ‘till you make it” meaning you go through the motions for a bit and let the fun, adrenaline, connections, distractions and the rest take over for a bit. If you focus on the feelings, then homesick wins. This actually is more important and yields time and time again the best results both for preventing homesickness or getting through a particularly rough patch of it. Never make a pick up deal with your camper (meaning, “If you still don’t like it after a week, I’ll come get you). It is counter intuitive to the real message you want to send which is, “I’ve picked a safe, wonderful camp for you to go. They will meet all your needs. You can handle things and ask for help when you need it. Even if it’s not perfect, you’ll figure things out along the way, have an adventure and I’ll see you soon”. A pick up deal, given with good intentions, usually meant to soothe anxiety, supersedes everything when we are working with a camper, asking them to work on their feelings. It is like always having a trap door you can push if you need it. Again and again, the campers with pick up deals more often than not go home. It is the campers whose parents give them clarity and understanding and say in their own words “We know you are struggling, we get it. We know you are getting support and care and that you can do this. We are proud of your effort and of you but we are not picking you up. We can’t wait to see you after camp”. Those are the types of responses that elicit tears and then the following 24-48 hours later, I usually hear from their staff that they are having a great day. Clarity, confidence and commitment; gifts from these parents to their camper. I’m reminded of a classic psychology study from 1960 that included observing the emotional feedback of babies crossing a raised Lucite box to get to his or her mother. The mother was instructed to either show scared emotion, no emotion, or a confident, positive one. These babies are no different than our campers. And (unfortunately) we cannot fake it. When they look at parents, they must see and feel the confidence and certainty- in your face, your voice, and woven throughout. Confidence, also in their ability to manage what ever comes up, with who ever is around, what ever is in front of them, without exceptions. Confidence that they can be flexible, they can be problem solvers, confident that they “got this.” If there is something that stops you from feeling that, go and find it separate from your camper. Campers are often aware of stress in a household, and that can affect a camper who usually is not homesick but suddenly one summer is, i.e., parents fighting or impending separation, chemical use, illness in the family, job or financial stressor, etc. If these are going on, it is so useful to let us know before camp to discuss how we can be helpful to your camper. In the mean time, Practice, Pack and Prepare. Many kids have not had a great deal of experience being away from home. Practice with sleep overs at grandparents and friends,. Be thoughtful about the process and celebrate those successes. Prepare through role-plays trying out issues with assertiveness, issues with friends, even how to ask staff for help. Have your camper help you pack. Have them pick out their flashlight and Shabbat whites, even if, no, especially if they are different than the one’s you like! Remember, the reasons of tolerating the uncomfortable feelings, are because of the growth, because of the independence, because of the confidence that comes after finding success in doing more by yourself, thinking more for yourself and even solving problems if they arise. Many parents after camp will ask me, “Now what do I do? My camper won’t stop crying. She says she’s not homesick, she’s campsick!” Oy. That is for another blog. If interested in reading more, ask us about the articles we suggested for our book club!